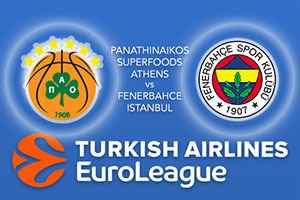 The Euroleague Playoffs get underway on Tuesday and this game, classified as Game B in the schedule, gets us underway. Given that these two teams are amongst the best ranked defensive units in the league means that this may not be the fast-attacking start that many people want to see but it should provide us with an interesting and intriguing start to the Euroleague Playoffs. There is personal intrigue added to the clash with Fenerbahce coach Zeljko Obradovic returning to Athens. Obradovic won five continental titles with the Greek side and this will be the first time he has come up against his former side in the Playoffs. The Panathinaikos legend is yet to taste victory against his ex-employer, sitting with a 0-4 record in clashes against them. In the regular season games, both teams won their home match. In Greece the score was 81-70 in favour of Panathinaikos while the Turkish side grabbed revenge with an 84-63 win in the return fixture. Both teams have a number of players who can impact on the match and the home fans will look towards Mike James, with an average of 12.9 points per game and Nick Calathes, with an average of 10.1 points per game, to have an impact on this match. The Turkish team will be looking for Bogdan Bogdanovic, with an average of 13.6 points per game, to play well while Bobby Dixon, with an average of 11.3 points per game and Kostas Sloukas, who offered an average of 10.2 points per game are likely to be influential for the away team in this game. While it is the defensive players who are likely to come out on top, one moment of magic or a consistently strong showing from the key attacking players could make all the difference. This is not a do or die affair on Tuesday night and the side that loses knows they will have a chance to bounce back. However, everyone wants to start in the best manner and you should back Panathinaikos Superfoods Athens at -4, which is provided at odds of 1.90. If you’re looking for the Over/Under market, go OVER 145.0 which is on offer at odds of 1.90. Bet Now!